Gorgeous Model Home, would make a great rental home also! Unique, open floor plan with plenty of updates. Located close to the Community Amenities. Home offers 12' tray ceilings, conservation behind, alarm service, all appliances including washer & dryer. Community pool & amenities make the Sanctuary feel like a vacation resort. 3M hurricane film on all windows. Large family room windows for plenty of natural light plus tri-fold sliding glass door to large screened in patio. Enormous Master Suite with a seating area overlooking the patio, 2 walk in closets and beautiful Master Bath w/ garden tub, large, tiled shower with frameless glass surrounding it, dual vanities & water closet! 3 car garage, awesome front patio & covered & screened rear lanai w/ brick pavers. Beautifully landscaped, upgraded SS appliances, 18" tile throughout, Corian countertops throughout kitchen & baths, upgraded 42" cabinets, under cabinet lighting, large closet pantry, tall baseboards, fenced yard & much more. Plus newer AC, roof, complete exterior and interior re-paint & partial new carpet. 3 way split floor plan, 3 bedrooms with an office that can also be used as an extra bedroom. 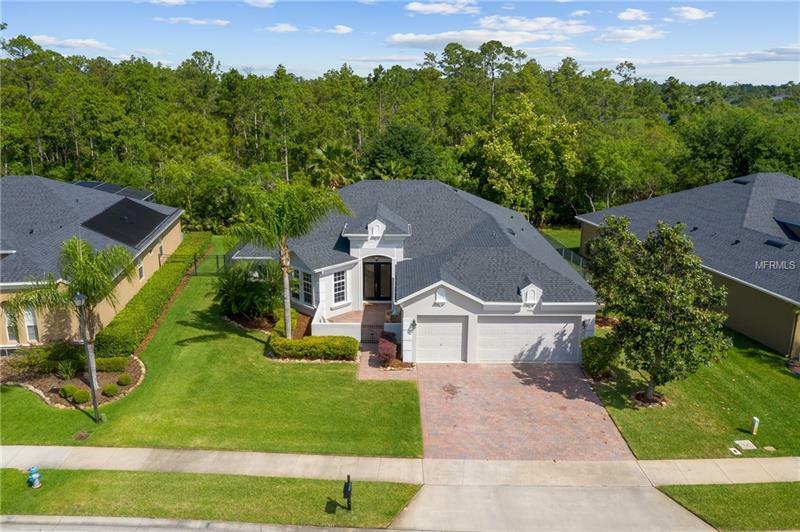 This home is in the highly desirable neighborhood of The Sanctuary in Oviedo, less than 5 minutes away from a brand new shopping center which also includes a Publix, easy access to 417, 419, 434, shops & dining plus Top Rated Seminole County schools! Don't miss out on this wonderful home! Pet Restrictions: Please confirm restrictions with HOA.